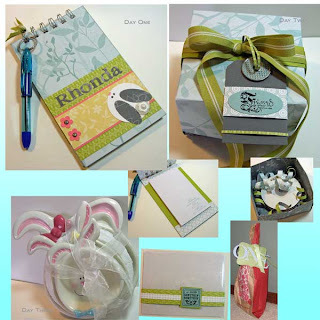 My Secret Sister was Rhonda, who is The Stampin' Bunny. I saw these adorable bunny serving dishes at a store and couldn't resist them for her. That became the cornerstone of my gifts and from there, I worked with some hints she had mentioned here and there, including that she loves the color Baja Breeze. I packaged her gifts each in a Trader Joe paper bag and tied them off with a Top Note die cut tag out of some of the Delicate Dots Designer Series Paper and tied them off with some of the ribbon from Sale-A-Bration also. I used the Serif Essentials Bigz Dies to add the day name to each tag. Day One: Covered Notepad - this easy peasy little cover uses two pieces of the chipboard from the DSP packages covered in Walk In The Park DSP. I created a pocket on the back inside piece by only using adhesive on three outside edges of the Kiwi Kiss card stock. This way a little notepad can be slid in and out and be replaced. For the cover, I made a little bunny out of several punches and added her name with the Natural Serif BS alphabet. The pen is a mini RSVP pen that has a hole in the lid, so I added a binder ring and attached it to the coils of the notepad cover. I used my Bind It All to add the coils to the front and back of the Cover. Day Two: Real Red Striped Ribbon in an Origami Box. I used more of the Walk in the Park DSP to fold this Origami Box and Lid. For the inside, I Crimped and rolled narrow strips of the DSP around my Paper Piercer for filler. For the tag, I stamped the 'Friend' image from the A Little Somethin' Level II Stamp Set in Black Craft ink and then heat embossed with Clear Embossing Powder. I punched it out with the large Oval Punch and layered it on the tag with a large eyelet from the SoHo Designer Hardware. Day Three: The Bunny dishes and Window Sheets. I cut a set of the Printed Window Sheets and placed them inside a Translucent Envelope. I used a strip of the Walk in the Park DSP for a belly band and finished it off with a badge using the A Little Somethin' stamp set - again with the Black Craft ink and Clear Embossing Powder. Boy, doesn't Rhonda do beautiful work? Lovely gifts - lucky you!!! !